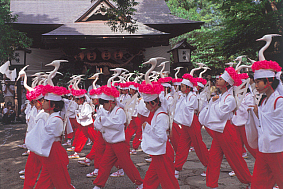 The heron dance(鷺舞, Sagimai) is a shrine ritual held as part of the Gion Festival at Yasaka Jinja Shrine(弥栄神社) in Tsuwano(津和野) on July 20th and 27th. 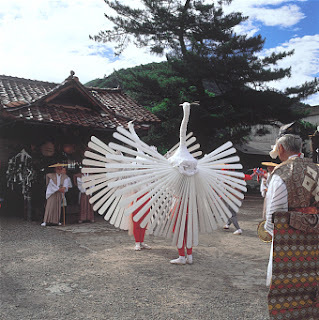 The lord of the Tsuwano domain started a heron dance on the model of the heron dance at the Gion Festival in Yamaguchi in 1542. The heron dance in Yamaguchi was modeled after the Kyoto Gion Festival. People living in Kyoto didn't know about european magpie(鵲, kasasagi), so they created a egret(sagi) in a woven hat(kasa). Now european magpies also live in the Kyushu region. After temporary interruption, two members of the domain was sent to Kyoto to master the dance in 1643. This dance is based on a Chinese legend that a pair of lovers separated by the Milky Way can see each other once a year on the 7th day of the 7th month and an european magpie with spread out wings works as a bridge for them. 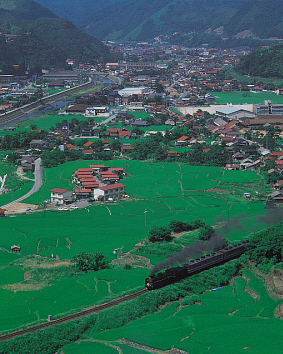 Tsuwano is a little and relaxing castle town and is referred to as the "small Kyoto in San'in Region." Old samurai residences line up and many colored carps swim in the roadside canals along the plaster walls there. Otome Pass(乙女峠) in Tsuwano is a Catholic holy site because 36 Christians were martyred for their faith there. The town is also the birthplace of Mori Ogai(森鴎外), one of Japan's great novelists. 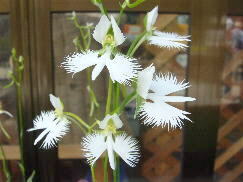 Fringed orchids or white egret flowers (鷺草, sagiso) have started to bloom. 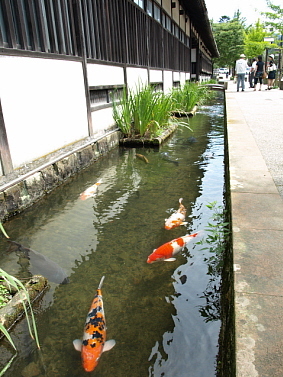 Sagiso(鷺草) literally means heron plant. It is named because the shape of its flower looks like an egret with its wings spread out. 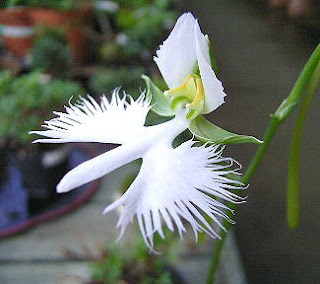 In Japan, this orchid is very popular and many cultivated ones are sold. However, they almost die in two to three years because of plant viruses. Fringed orchids which grows wild in Japan are in danger of extinction. 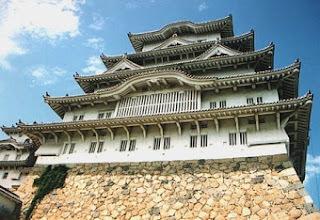 "White Egret Castle(白鷺城, Hakuro-jo or Shirasagi-jo)" is the nickname of Himeji Castle (姫路城, Himeji-jo). 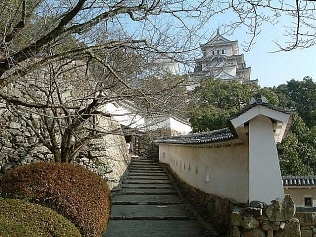 Most parts of the castle that we see today were remodeled by Ikeda Terumasa(池田輝政) between 1601 and 1609. The castle met an ironic fate. It was built as a strong fortress. Despite that, the castle has never had a severe attack and never received heavy damage. 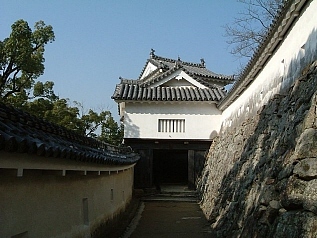 Ikeda Mochimasa(池田茂政), the lord of the Okayama domain, attacked the castle under the order from the new government in 1868. 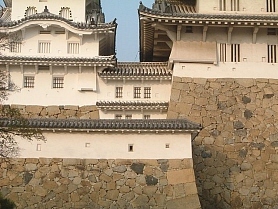 One of the gates of the castle was destroyed. Ironically, Mochimasa was a descendant of Ikeda Terumasa. When the central part of Himeji City was burned down during World War II, a junior high school on the site of the castle was also burned down. Although some incendiary bombs were dropped on the site, the castle was not touched. It is said targets included castles. 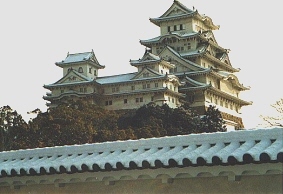 Nagoya Castle was burned down by air raids. 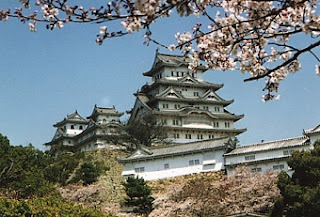 Most of the existing castles in Japan were rebuilt with iron and concrete in the postwar period.